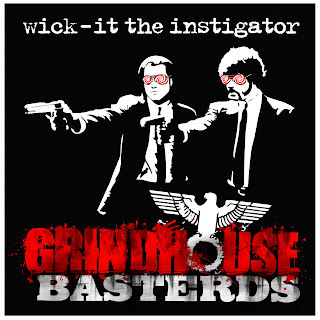 This Monday, Nashville-based DJ/producer Wick-It the Instigator released Grindhouse Basterds, a hip hop, mash-up, remix, electronic, dubstep, mixtape that comes with a heavy dose of everyone's favorite Quentin Tarantino films. It's the long-awaited, much-talked about follow-up to his wildly successful mash-up album The Brothers of Chico Dusty (Big Boi vs. The Black Keys) from last year that took him straight to the next level overnight. Now, Wick-It is melting faces all over the country on a nightly basis and his Grindhouse Basterds is exactly what all of his fans have been waiting for. It's no secret. Anyone that knows me well, knows that I don't really get down to much dubstep...if any at all. This mixtape is somewhat heavy on dubstep, I mean it IS Wick-It. But I can deal with it and I even found myself head-nodding pretty hard to the mixtape's namesake opening track Grindhouse Basterds, Reservoir Dawgz featuring Bun B and Yelawolf, and the remix of the Pulp Fiction Theme. It's all tastefully done in most spots and simply takes the tracks to the next level when he builds it up then drops it hard into the 'filthiness,' as the kids say. My favorite parts of the album are by far the hip hop remix/mash-ups. He features nearly every emcee in my top 10 (and then some) - including KRS-One, Notorious B.I.G., Slug, RZA, Ghostface Killah, Murs, Method Man, Aesop Rock, Busta Rhymes, Bun B and Yelawolf. Without question, for me, the strongest tracks are Shoalin vs. White Lotus, Bang Bang, Stuntman Mics, and What Happened to You. These tracks are just more up my alley. True to hip hop with a superb choice of acapellas over some very well-produced tracks. This is how I like my Wick-It. Plus, he gets extra points since Kanye isn't anywhere to be heard on it. Kudos, sir. I have been following Wick-It for a while. I helped book him at a club I was working at in Memphis 6 years ago or so. He was a dope DJ back then, but he has definitely taken it to a whole new level. In the last year, he has reinvented himself somewhat. It seems now he known for his dubstep rather than his hip hop DJ'ing by the younger generation. Regardless, he is a force to be reckoned with. His fanbase is steadily growing and his internet presence is off the charts. He has changed with the times, as all good DJ's must do to stay alive. Grindhouse Basterds is a just as good as I figured it would be. I would recommend it to anyone who is into electronic, dubstep or hip hop. It's good a great all-around showing of his skills as a DJ and a producer. I hope to hear more tracks produced by him for dope emcees, majors and indie cats. It would be great to see him able to educate the younger generation he captivates with his dubstep on the importance and beauty of old school hip hop- which I know he loves just as much as me. It's present on this mixtape and I only hope he keeps it up. Grindhouse Basterds also features some strong performances from Nashville emcees Future, Cas One, Iller and Tre E (from Sam and Tre). Now, GO download or stream the album for free on his website: wickittheinstigator.com. You'll thank me.